Taking a look at the graduation rates of black football players among the teams in this season’s bowl games, it is starkly evident where America cherry-picks its investment in young black men. As Obama cajoles the rest of the nation to care about ordinary black men faced with, in his words, the “consequence of neglect over generations,” the nation’s universities say if you have the talent to play football, they will cast a net that can hold 300-pound linemen. I originally started the Gap Bowl at The Boston Globe because the federal graduation rates, which give schools six years to graduate players, were abysmal at most top programs. In 2001, the Knight Commission on Intercollegiate Athletics recommended banning teams with graduation rates below 50 percent from conference championships and postseason play (the commission cited my work in its findings). But overall graduation rates of 50 percent or more hardly end exploitation since they often mask vast disparities between high rates for white players and low rates for black players. Because of that, I have also long said that teams should be banned from tournaments and bowls if black player rates were below 50 percent. In 2003, for instance, only 15 of the 56 programs that made the bowls reached the 50-percent threshold for black players. It was so bad back then that Michigan, which had an 81 percent student-body graduation rate, was at 36 percent for black players. Powerhouses Ohio State, Oklahoma, Tennessee, Pittsburgh and Arkansas had respective black-player graduation rates of 28, 28, 26, 23 and 16 percent. In all in 2003, there were 15 schools that were under 35 percent for black player graduations. After years of public pressure and shaming through sanctions — such as the 2013 tournament ban on Connecticut’s basketball team — the graduation rates have risen dramatically. Aided by a more modern measure called Graduation Success Rates (GSR), which account for transfers and do not penalize schools for athletes who leave early in good academic standing, 77 of the 82 bowl teams now have GSRs of 50 percent or higher for black players, with 40 schools being at 70 percent or above. But that success did not come without creating its own disturbing disparities. Football teams ought to have outstanding graduation rates given the levels of financial investment that shock the conscience. Bowl-eligible Division I universities have annual per-student academic spending of $15,615. But Auburn spends $511,745 a year per scholarship football player, according to the Knight Commission’s database. Nineteen schools spend more than $250,000 per football player, including all of the eight top-ranked programs. In the college-football fanatic South, Auburn, LSU, Florida State, Georgia, Oklahoma, Central Florida, Arkansas, South Carolina and Virginia Tech spend 19 to 32 times more on football players than on regular students. Midwestern and Western powers were not as crazed, but the spending at Ohio State, Wisconsin, Michigan, Minnesota, Penn State, Washington and Iowa was still nine to 17.5 times higher than for the average student. No matter how much of a football fan one might be, the hypocrisies abound. The lavishing of resources on athletes comes in an era of fiscal retrenchment on the academic mission by most state legislatures. According to the Center for Budget and Policy Priorities (CBPP), 46 states spent less on higher education in 2015-16 than before the 2008 recession, a total of $10 billion less. Nationally, state university spending remains 18 percent down from the recession, according to the CBPP. Meanwhile, according to Knight Commission data, per-football-player spending soared since the recession by a respective 42 percent, 31 percent and 28 percent in the Big Ten, Pac-12 and the Southeastern Conference. According to the 2014 annual report by the American Association of University Professors, the median pay of head football and basketball coaches rose about 100 percent between 2005-06 and 2011-12 despite the recession, compared with a 4 percent median rise for full professors at doctoral universities. While constantly telling full-time faculty to do more with less, campus presidents and legislatures have turned a blind eye to the fact that only one out of five athletic programs in the Football Bowl Subdivision turns a profit. 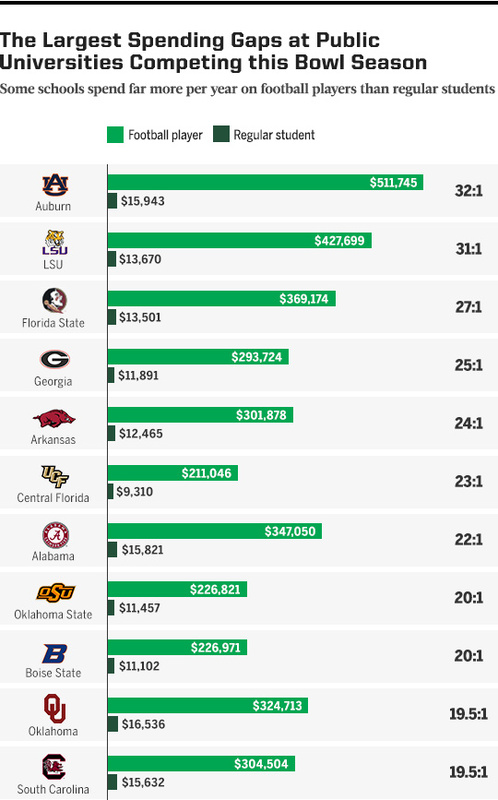 According to USA Today, 58 head football coaches now make between $2 million and $9 million a year, and more than 500 assistant coaches make between $500,000 and $1.5 million. According to The Washington Post, total spending on athletic facilities at 48 teams in the top five conferences nearly doubled between 2004 and 2014, from $408 million to $772 million. The Post reported student fees buoy athletic departments to tune of $125.5 million at 32 public universities in the “Power Five” conferences. One irony is that the spending, supported by student fees, has created academic support for athletes beyond the dreams of typical students. According to a study by Scott Hirko, a professor of physical education and sport at Central Michigan University, study services for athletes rose dramatically despite the recession. At top football powers, the support became million-dollar operations, with the budget rising 48 percent and the number of full-time tutors rising by 34 percent between 2005-06 and 2010-11. One can only imagine how such resources could alter the trajectory of ordinary students, particularly African-Americans and Latinos, whose graduation rates usually lag behind those of whites and Asian American students. It stretches logic to think that an educated athlete at Auburn is actually worth 32 times more investment to produce a worker 32 times more valuable to society after graduation than a nonathlete, especially since the vast majority of athletes become everyday workers after graduation. The same with 31 times more at LSU, 28 times more at Georgia, or even 16 times more at Wisconsin and nine times more at Michigan. The value gap should be freshly questioned as the rigor of classes taken by athletes has been muddied by the recent investigations of academic fraud at prestigious Notre Dame, North Carolina, Syracuse, Missouri and Southern Methodist. This does not mean universities should stop investing in athletes. It is gratifying to see that some of the purest forms of college sports exploitation, using up players and spitting them into the real world without work skills, are fading away (this is not to ignore the spiraling compensation gap between so-called “amateur” players and coaches paid at NFL levels or schools, corporations and television networks profiting off the image of players — as evidenced by the failed Ed O’Bannon lawsuit and the unionization attempt by Northwestern University’s football team). Universities made them in athletes, but in doing so, they lost sight of common ground. It is one thing to get athletes in academic shape to walk across the graduation stage. But that investment cannot be so immense that it amounts to trampling over the rest of the student body.